Unexpected Productions is offering a new type of theatrical event, Market Ghost Stories, a ghostly adventure through the Pike Place Market. This 75-minute excursion leads you through the Market’s unusual arcades and spooky alleys while sharing the often overlooked darker history of Seattle. The Market at night is empty. A limited few get to see the “skeleton” of the Pike Place Market. 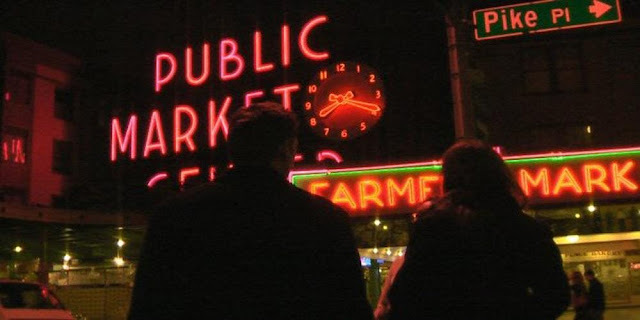 Market Ghost Stories is an interactive experience focuses heavily on storytelling and connecting guests to the long haunted history of the Pike Place Market. By connecting each building, each landmark, to the ghost stories told you will see the Market in an entirely new way. Led by members of Unexpected Productions Improv, Market Ghost Stories is the evolution of the original Market Ghost Tour. Who better to share stories than an improv company that has been weaving stories for 35 years. Tours run Saturday - Sunday 5:00, 7:00. Meet at Unexpected Productions' Market Theater, at the infamous gum wall. The tours are scheduled for every weekend through the end of the year. The Pike Place Market is the number one tourist destination in Washington, attracting more than ten million visitors a year. However, very few of those visitors are allowed access at night. The ghost stories illustrate the history of the district. Within the Market, there are the remnants of several graveyards, a former brothel that still stands with its original sign, the nation's first mortuary and stories on every corner.